My Creative Existence: March 08 Photo Challenge! This month, Renee D's Photo Challenge was to take an action shot - something fast moving! 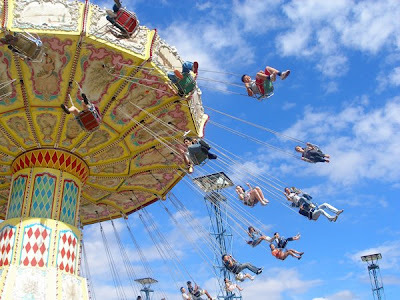 So when I was at the Easter Show today, waiting in line with the kids for a ride, I looked up and saw that we were near the swing ride! Right place, right time, for a great action shot! Unfortunately, I don't know anyone in the pic - they're just random show-goers! I used my Olympus SP350 for this shot - I didn't take my Canon SLR to the show because it would have been too cumbersome, and I didn't want it to get ruined. The kids had a ball today at the show - and this morning with their egg-hunt! Im sure you will see layouts in the weeks to come with photos from today, because I got lots of pics! I hope you and your families all had a lovely Easter Day together! Hey! We were at the show yesterday too! Shame we didn't bump into each other. Love your pic. I didn't get many due to whingy kids. But am going back Wednesday night for some night & fireworks shots. Just me and my tripod! Hope your Easter weekend is going great. Are you an Inkurable Stamper?? More "Book of Me" Pages. The Savvy Celebrity Spotlight on Lusi Austin! Darkroom Door is now open! Scrap Outside the Page - Invite Set. Mel's Savvy Scraplift - March '08. Mel's Savvy Scraplift - February '08. Sarah's Random Challenge! March '08.